Chateau / Country House8611 sq. ft.
17 to 33 guests, 16 bedrooms ensuite. Tennis, Wi-Fi, Weddings. Daily cleanings. Villa Petrolo is an 18th century manor house, built by Massimiliano Soldani, architect sculptor and medalist for the Medici Family, as his own residence. It’s now available for holidays, weddings and events. The property can host from 17 to 33 people in 16 bedrooms (in twins or doubles +1 singles and 2 triple bedrooms). Includes daily 4 hours cleaning service, private swimming pool 6x12 mt, free adsl Wi-Fi, billiard, tennis court, ping pong, Satellite TV, two kitchens, large living rooms, 1 grand hall and fireplaces for cozy winters. The house is over 750 sqm (8100 sqft) and has vast private gardens of over 1 ha all around with fountain, century old cypresses and holm-oak woods. The interior decoration, arranged with attention to the smallest details wants to keep the traditional “landed gentry” feel and consists mostly of antique furniture, with both antique and modern paintings. By the house we also present a selection of the estate’s products: our fine wines, organic E.V. Olive oil and honey. Delicious informal meals, full board, half board or just occasionally, can be requested, prepared by our family cooks, in traditional Tuscan style. -Main Villa, for up to 17 people:9 bedrooms ensuite. Vast hall with Murano crystal chandelier and large living rooms. Tenuta di Petrolo, with its famous winery and prestigious production of Organic Extra Virgin Olive Oil, is placed on the slopes of the hills bordering the Chianti region overlooking from its favourable point of view the lovely valley of Valdarno Superiore. The Estate is surrounded by green olive groves, active vineyards and beautiful oak woods in an area full of charm and history. Dominating the countryside and landmark of the Estate, is the Tower of Galatrona which foundations date back to the Etruscans and Romans. The Tower itself lends its name to Petrolo’s wines, the 'Torrione' (which means big tower) and the 'Galatrona'. Petrolo’s manor house, the Villa, overlooks the ancient Romanesque Pieve (parish church) of Galatrona, which houses precious renaissance works by Giovanni della Robbia. Three small private lakes, were fishing is possible, complete Petrolo’s scenery. On request interesting visits to the wine-cellars and traditional olive-mill can be organized as well as tastings and purchase of the estate's products. Available for our guests there’s Wi-Fi internet in all properties. Petrolo can accomodate its guests in the Villa and in three independent farmhouses: Costa, Vigna, Feriale I and Feriale II. Managing up to 65 guests. changed weekly included. extra change possible. 2 kitchens. One for catering use and the other for your own self-organization. Catering is an extra service. It is tailored to your needs as long as hearty Tuscan meals are what you're looking for. Villa Petrolo has a vast private garden of over 1 hectare, a 6x12 meter swimming pool and a tennis court surrounded by secular cypresses, for the exclusive use of the villa's guests. The interior decoration, in which every detail has been paid attention to, is made up in most part of antique furniture, with both antique and modern paintings. Villa Petrolo is the XVIII century manor house of the awarded Petrolo winery. This Villa combines elements from Tuscan rural gentry and transforms them to make you feel at home. It’s ideal for a large group of friends and family wanting to enjoy this wonderful part of Tuscan countryside among the Chianti mountains. 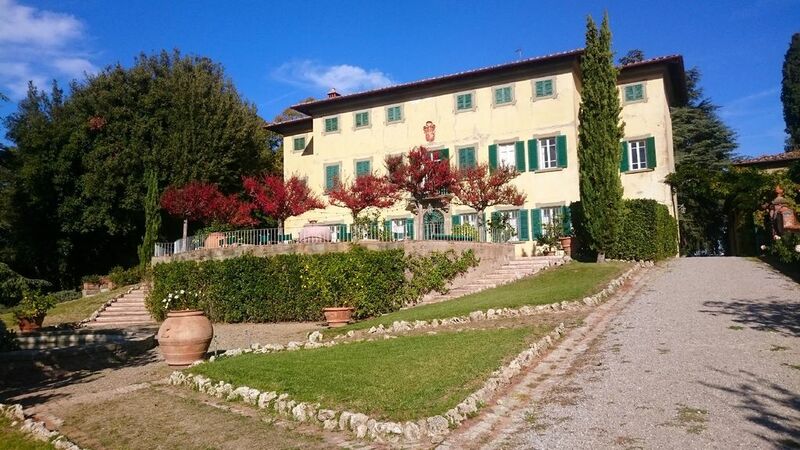 The property is within 30-45 minutes from the main cities of Art in Tuscany, between Florence, Siena and Arezzo. Villa Petrolo has a vast private garden surrounded by centuries-old cypresses with exclusive swimming pool, tennis court and daily cleaning service. Lovely vineyards, olive groves and woods will welcome you on arrival. Landmark of the area is the old Medieval watchtower of Galatrona which can be visited, on request also with the antique Parish Church with renaissance art by “Della Robbia” just opposite the Villa. Award winning wines are made with passion here at Petrolo, you'd be most welcome to have a wine tour of our cellars or try our precious organic Extra Virgin olive oil. The interior decoration, arranged with attention to the smallest details, consists mostly of antique furniture, with both antique and modern paintings keeping it's original landed gentry decor. Our maid will clean your rooms every morning. The Villa has 16 bedrooms on 3 floors and 13 bathrooms of which 9, on the first 2 floors are ensuite. Choose between rooms with shower or tub. Twin bedrooms can be joined on request to make king size doubles. All guests will enjoy double cushions and a set of towels, also for the swimming pool. Private swimming pool opened from May to end Sept. (12x6mt, deep 1,5 mt to 2,5mt), 4 h daily cleaning service, Wi-Fi internet, exclusive Tennis-court with raquets, Ping pong, Billiard, private garden, Outdoor furnitures, Sky-tv, 2 Equipped Kitchen, Large Fireplace, Wood provided, Bed Linen & Towels, Dishwasher, Washing machine, microwave, independent heating, clean linen changed weekly, Electricity, water, gas for kitchen & hot water, car parking. Iron & Ironing board. Coffee maker: Filter, Moka and Espresso. It’s an ideal location for a romantic country feel without renouncing to details. Through our contacts, we can recommend you services that can assist in the arrangement of a bespoken wedding. You can have a religious catholic celebration by the old medieval Church of Galatrona just opposite the villa, a civil celebration with the local municipality directly at Petrolo, or a symbolic wedding of your choice. Wedding planners can be a precious resource if you don’t want to be overwhelmed by the organization. The halls of the Villa can be easily adapted as simple conference rooms. Any special equipment is rented according to needs. At only 1 km distance, in the nearest village, you can look for groceries, banks, pharmacy and other services. The area has also several local food markets and very good restaurants we can recommend to you. Being in the heart of Tuscany, the many historical cities of art and the Unesco world Heritage sights of the region are all at short distance: sightseeing Florence, Siena, Arezzo, SanGimignano, Chianti Classico, Montalcino, Assisi, Lucca, Pisa and many others is quick and easy. Our area is also great for its local food tradition, wineries and restaurants and to immerse oneself in the countryside doing trekking, horse riding or renting bikes. Shopping in the fashion outlets of Prada, Gucci and many other firms is possible with a very short ride by car. Not to forget is also the possibility to spend some time in the local thermal baths of Rapolano Terme. Book Villa Petrolo for 17 guests or for 33 guests. The property will be your exclusive house in either cases. Prices for 17 people. -Upgrade to max 33 guests in 16 bedrooms -Tourist Tax: 1,5 €/person per day – Max. 4 days (6 Euro) -Heating: on consume, 4€/m3 by readings by thegas meter. Approximately 10€/h -Extra towels & linen change: 10 € full change -Extra cleaning: 20 €/h -Catering available on request at extra cost. Additional info about Petrolo Società Agricola s.s.